We have added a link to the new Books in Print 2.0 Web site on our main database Web page and removed links for the old Patron and Professional Editions of Books in Print. The old versions will no longer be available in 2012. Fiction and Non-Fiction Connection are still directly accessible from Books in Print 2.0. On Thursday, December 1, the Writing Center will hold a workshop on thesis development in Library room 028 at 4 p.m. This presentation will explain what a thesis is, why it is so important, and how to craft a strong thesis for different types of writing. Students will practice creating a thesis based on a given topic. They may also bring their own thesis statements to receive help from the presenter. Proof-of-attendance sheets available upon request. 11/30 – Symposium of Student Research (4:00 pm – 6:00 pm) – University Foundation is sponsoring this student research symposium. 12/1 – Honors Contemporary Latino Cultures speaker – Paul Martinez will speak. 12/1 – Linking Language Learners present International Crafts – The Student organization, Linking Language Learners, will hold their annual International Craft night. Come and see what people around the world make! 12/2 – Honors Contemporary Latino Cultures speaker (3:00 pm – 5:00 pm) – Benjamin Saenz will speak. A cart that will be accepting a variety of goods will be in various locations on campus over the next several weeks. The Terre Haute Humane Society continues to be full of furry friends looking for a loving home especially during the holiday season. Staff and students at Indiana State University hope to make the animals’ short stay at the shelter a happy and hopeful one by taking donations of many needed supplies. Toys, canned food, towels and blankets to snuggle in are just a few things on the “Wish List” for the Terre Haute Humane Society and money for the supplies is always appreciated. The donation drive, sponsored by the College of Technology at Indiana State University, hopes to “Fill the Cart” from different areas of the university so van loads of supplies can be delivered to the shelter prior to the holidays. Charles Mayer, professor emeritus of art history, donated his collection to the ISU Foundation. The collection of 8,147 books, 163 journal titles and 457 photographs and other media items is housed at the university’s Cunningham Memorial Library. BookNation, which in September celebrated its 20th anniversary as an independently owned bookstore, will close its downtown Terre Haute store in January. “We’ve had a good run, but it’s not getting any easier to keep a bookshop open in today’s world,” said owner Todd Nation. AAUW of the Wabash Valley, ISU Women’s Studies, and the ISU Library invite you to celebrate the 130th anniversary of the founding of the American Association of University Women. The Library still leads the Divisions in United Way campus donations! We are at 40% while the next Division (the Scott College of Business) is at 23%. Although it’s great to be in first place and hopefully win the free breakfast for those who pledge, what makes it truly wonderful is the number of people here in the Wabash Valley who will be helped by your donations. Thank you. And remember that donations are still being accepted. For a pledge form, please go to http://www.indstate.edu/unitedway/pledge_form.pdf . 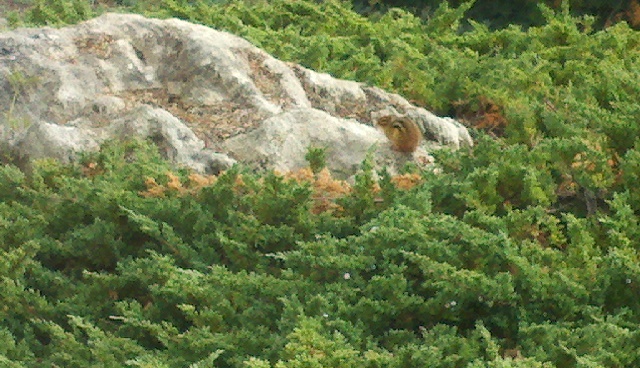 When you have a decades old building surrounded on 3 sides by decades old shrubbery, you could end up with many generations of chipmunk. They live their own lives and you can often find one perched, majestically or watchful or possibly just pensive, sitting on one of the rocks amongst the shrubs. This one was on the south side, on our chilliest day thusfar – today – with a little breeze. 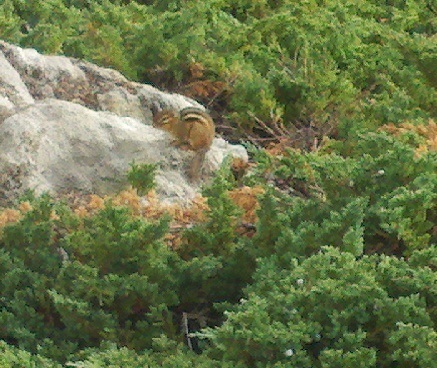 Just after I snapped these with my Android on its fullest zoom, it turned around and looked at me accusingly.